Find out more about these highly nutritious beans. Fava beans, as they are called in the Americas, or broad beans, as they are more commonly called in Europe, Australia and New Zealand, have been a part of diet in the eastern Mediterranean since about 6,000 BCE. 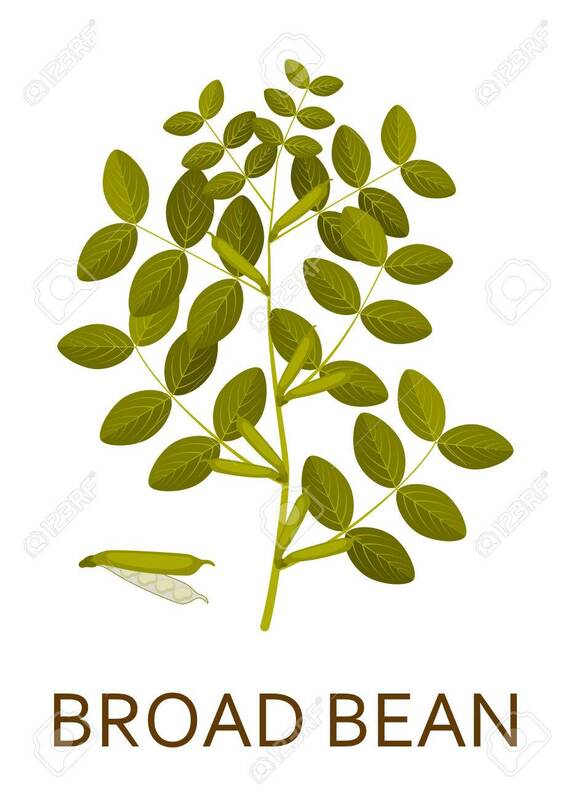 They grow in broad, leathery pods, like much enlarged pea pods. 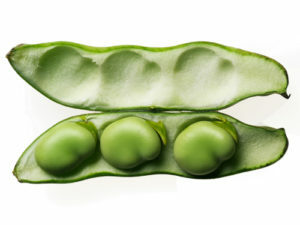 Each pod contains three to eight oval beans. The term ‘broad bean’ refers to the larger-seeded cultivars that are grown for human food, while ‘horse bean’ or ‘field bean’ refers to cultivars with smaller, harder seeds mainly (but not exclusively) used for animal feed. The fava bean is a hardy plant. It can withstand harsh and cold climates. Preparing fresh fava beans can be a bit of a pain. 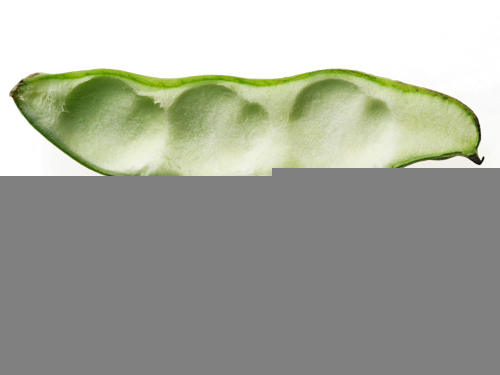 When buying the beans, choose green pods that are firm and don’t bulge. The bulging pods may be old and often have a bitter taste. To remove the beans from the pods, just run a thumb nail along the seam of the pod to split it open. Take out the beans. They are surrounded by a thick white skin that needs to be removed. You can get rid of the skin by using a sharp knife to make a small slit along the edge of the bean. This will allow the raw bean to pop right out. But this is a lot of hard work … bean by bean! You can get around this by putting put the beans into boiling salted water and parboiling them for about a minute-and-a-half. After that put the beans into ice-cold water so they stop cooking. Now you can squeeze the beans right out of their skins. Still … preparing broad beans is hard work. It takes about 3lbs or 1.5kg of fava pods to get one full cup of beans. Broad beans are usually eaten while they are young and tender. If they are planted in early winter, they can be harvested in the middle of spring. If they are sown in early spring they will be ready by mid-summer. 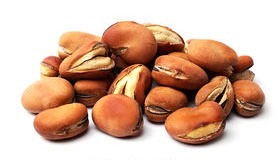 Horse beans, on the other hand, are left to mature fully. They are harvested in late autumn and can be eaten by humans as a pulse, though they are most commonly used as animal fodder. Broad beans were a major foodstuff in the ancient civilizations of the Mediterranean. They were especially popular among the ancient Egyptians, Greeks and Romans. They eventually spread along the Nile Valley to Ethiopia, northern India and China. Fava beans can be eaten in a variety of ways. For example, you can steam them until they are tender and then toss them in fresh lemon juice. They are lovely in a mixed green salad. Mashed fava beans can be used as a spread on bread or crackers. They are at their best as fúl medammes, which is very popular as a breakfast dish in Arabia. It makes a great lunch. Making fúl medammes is really easy. Fry finely chopped garlic and onion is a pan using an extremely small amount of virgin olive oil. Once the garlic has been softened, add the fava beans and a little water. Bring to the boil and mash the beans with a wooden spatula. Once the goo is piping hot, pour it into a bowl and service with oat cakes (thin sugar-free biscuits made from oats). In parts of Latin America, mashed fava beans are used as fillings in corn-based snacks. They are also used whole in vegetable soups. The beans can also be dry-fried, causing them to split open. You can then spice them to produce a savoury, crunchy snack that is popular in northern Iran, Malaysia, Thailand, China and Latin America. The immature pods can also be cooked and eaten. In addition, the young leaves of the plant can be eaten, either raw or cooked in the same way as spinach. How nutritious are fava or broad beans? The simple answer is … very nutritious. The percentages refer to the recommended daily amounts for an adult. As you can see from the above, dietary fibre makes up 25% fava beans. Another 26% consists of protein. In addition, fava beans are especially rich in micro-nutrients such as the B vitamins, notably folate and thiamine. The broad beans are also full of phosphorus, manganese, magnesium and iron. Fava beans are one of the top high-folate foods (vitamin B9) around. Folate helps metabolise your energy, supports your nervous system, and keeps red blood cells healthy. It’s also a must for pregnant women. Hypertension … 85% of diabetics suffer from high blood pressure. Studies show that magnesium can lower blood pressure. Broad beans are loaded with magnesium. Heart disease and stroke … hypertension and diabetes increase the risk of heart disease and stroke at least three times compared to the risk among the general population. Thus improvements in your blood pressure will reduce your risk of suffering a heart attack or stroke. Weak immune system … is another consequence of diabetes. Healthy white blood cells are necessary to support a strong immune system because without them your body is very susceptible to illnesses and infections. White blood cells destroy pathogens that cause diseases and help eliminate free radicals found in your body. Copper helps maintain healthy blood cells, and broad beans contain significant amounts of copper thus helping to strengthen your immune system. Reduced energy … many diabetics experience a feeling of sluggishness. This ongoing tiredness can be due to a lack of iron which is required to produce haemoglobin. Haemoglobin carries oxygen to the cells throughout your body. 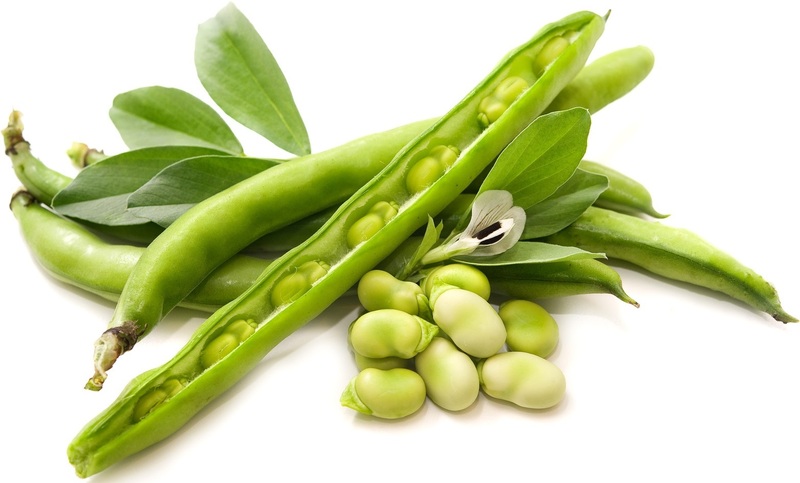 Fava beans contain significant amounts of iron and their consumption can help put pep back into your step. Development of osteoporosis … can be prevented to an extent with manganese. Manganese helps increase bone mass and helps reduce calcium deficiency. Fava beans contain significant amounts of manganese. The US National Library of Medicine suggests that consuming forms of manganese along with calcium, zinc and copper may help reduce spinal bone loss in older women. Risk of birth defects … can be reduced with folate (vitamin B9). Broad beans contain very significant amounts of folate which, as well as being great for providing energy, has long been associated with helping to reduce birth defects. A meta-analysis of research on folic acid supplementation, published in Scientific Reports by the US National Library of Medicine National Institutes of Health in 2015, found a positive association between folate supplementation and a decreased risk of congenital heart defects. Birth defects often arise during the first few weeks of pregnancy at a time when many women may not know that they are pregnant. The Center for Disease Control and Prevention and the US Public Health Service recommend that all women between 15 and 45 years (the child-bearing ages) consume 0.4mg (400μg) of folic acid every day to help reduce the risk of birth defects, spina bifida and anencephaly. Poor motor function … due to Parkinson’s disease may be helped by eating broad beans regularly, according to some studies. Research published in the Journal of Clinical & Diagnostic Research examined the effects of eating fresh fava beans with their outer shells, fava beans dissolved in alcohol and water, and dried sprouted fava beans. The researchers discovered that the increase in the levels of the amino-acids L-dopa and C-dopa in the blood stream from the fava beans caused a significant improvement in the motor performance of patients with Parkinson’s, without any side effects. Fava beans are not the most tasteful food on the planet. But spice them up a bit and they are a pleasure to eat. Most people tolerate them very well. A few people are allergic to fava beans. However, cooking the beans thoroughly can help reduce the risk of an allergic reaction. Consuming broad beans can be highly detrimental if you have glucose-6-phosphate dehydrogenase deficiency. G6PDD is an inborn problem with your metabolism that predisposes you to a breakdown of your red blood cells. It is very rare. This breakdown can be triggered by a variety of infections, medications, stress and a few foods such as fava beans. Thus if you have G6PDD, you must avoid eating broad beans. Monoamine oxidase inhibitors (MAOIs) are a class of drugs that have a long history of use in the treatment of depression. 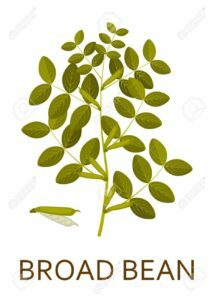 These drugs interact unfavourably with other medicines and certain foods, so if you are using these drugs you should avoid eating fava beans. Despite all this, it is a good idea to add broad beans to your diet unless you have a medical condition that can be affected negatively by the beans or you are taking medicines that can cause you to have an adverse reaction to the beans. But if you can handle them without any health issues, you should avail of their potential to reduce your diabetic’s risk of heart disease and strokes, to boost your energy levels and immune system, to help your motor function and so on, by consuming broad beans on a regular basis. I enjoy a bowl of fava beans laced with garlic and onion for lunch at least once a week in the form of fúl medammes. Previous Previous post: Flaxseeds V Chia Seeds ― which are more nutritious?